Sumeet Vyas finally found his 'Permanent Roommate' in Ekta Kaul and we have all the insider pics & deets for you! I am sure by now you know that Sumeet Vyas found his Permanent Roommate after all! After an engagement that took the internet by storm their intimate wedding has been making a lot of noise too. Looks right out of a fairytale, doesn't it? Did you notice the decor here? Totally digging that. How cute are these lovebirds? 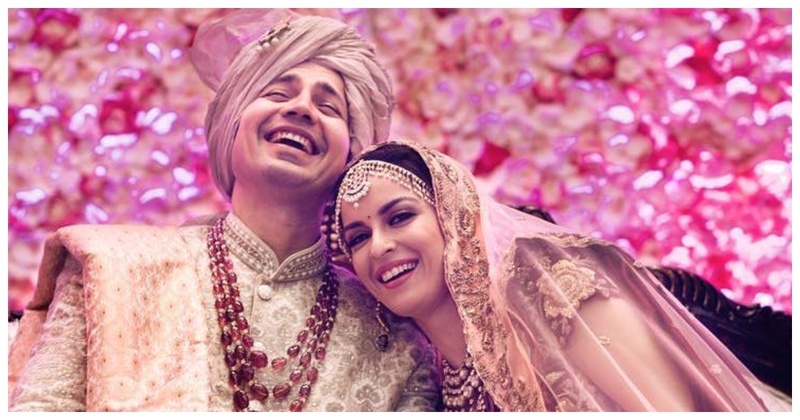 Well as they say, “Happy Brides are the prettiest” and I say, Ekta Kaul is definitely a proof of that. Also, totally loving the off-beat lehenga that she chose for her mehendi - such unique colour combination. This one is giving me some major #RegalVibes. What do you think? Just like the couple, their wedding invite was quirky too. It starts with - ‘Holy sh*t! Sh*t just got real! ’How totally awesome is that? And here’s what our very own Mikesh has to say about it, “It is a reflection of me. Actually, I did not want it to be a regular and boring card with a lot of details, but a quirky yet simple one. Ekta ideated, the designers sent a few designs and we jointly decided to go ahead with this. Being a writer, I came up with the content." Well well, here’s wishing this happy couple a lifetime of togetherness!